It’s been 2 weeks since E3 Coach and elite AGer Jana Richtrova and myself arrived to the Big Island of Kona, HI for her final preparation of for the Ironman World Champion. This after her successful performance last year which led for her to want to come back again this year. However, racing in the heat has always been extra challenging for her, so we decided to arrive earlier this year for better acclimatization. Allowing her to do final key training sessions which would gives us better data for her racing/fueling plan. Among the data we have been collecting includes power & heart rate from all her rides and this in turn enabled me to more accurately determine her current coefficient of drag based on racing setup using the awesome tool BestBikeSplit developed by master mind Ryan Cooper and owned by TrainingPeaks (TP). We already use TP and it metrics to develop the program for all our athletes, but the addition of BestBikeSplit is been an amazing tool for our coaches for better and more precises race plans. This has helped our athletes to no only execute better on the bike, but also, to learn from their performances for future races. And for me, it has helped addressing their bike position and gear selection as using the Time Analysis tool. Both BestBikeSplit and TrainingPeaks are amazing tools for coaches to better plan, advise and guide their athletes! Anyway, all the data we have collected over the past 2 weeks has helped me fine tune Jana’s tapering and model a few scenarios for Saturday. Tomorrow I’ll post more about it and share her Saturday’s model (maybe!). Also, we have been working with Levelen all year to test our athletes sweat rate & electrolyte loss to provide the best possible fueling plans, a key element of our athletes success in long course. Why? Because it takes the guessing out of the equation in terms of what I call the Fueling trinity: carbohydrate (carbs), fluids and electrolytes. All vital for optimal performance and to enhance recovery. If you don’t know how the testing works, you can check the video below but in short, it tests your specific sweat & electrolyte loss at a given activity and weather conditions. In Jana’s case, we tested back in January to get her “post-season” baseline. That is, what was her sweat rate/electrolyte loss and carbs needs back then given her fitness level and training conditions (licing in Boston this meant, indoor riding and outdoor running). Knowing this allowed us to formulated her fueling plan for optimal training and better recovery. Her sweat rate and electrolyte loss was high in spite of training in milder conditions (~70 degrees F. and 50% humidity). On average she losing around 50 ounces (oz) of sweat per hour at 70 degrees/50% humidity and around 1700 mg of sodium when running (lower when cycling). 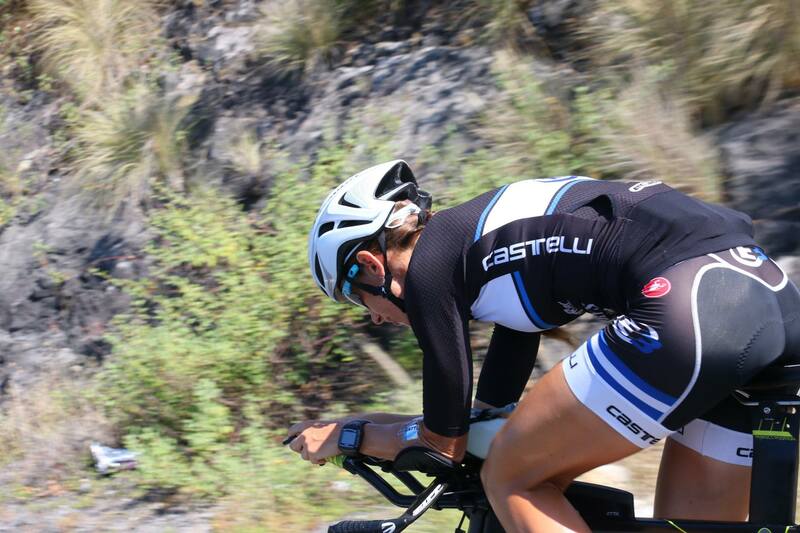 In March we tested again as final prep for Ironman Texas, the race she would try earning her Kona spot. while we attempted replicating the hot/humid TX race conditions. Her sweat rate increased a little as she was in better “form” hence her body was more efficiently cooling itself down, but her electrolyte loss remained similar. Her numbers increase to around 60 ounces (oz) of sweat per hour at 77 degrees/60% humidity and around 1750 mg of sodium when running (again, lower when cycling). But we used this to develop her TX plan knowing it would still be an extra challenging day for her as she wouldn’t have the chance to acclimatize. Unfortunately this proved true affecting her run, but still, she earn her spot! She was tested again in July and the numbers remained similar to March ones, even though she adapting to the summer hot days. Through the summer she successfully defended her title at the Patriot Half Ironman and had a bit of a tough day at Timberman 70.3, but, in retrospective, it was perhaps expected due to the early season Ironman training. But we’ve continued to adjust her program and over the past 6-8 weeks, she has been posting her best numbers which is what we wanted. And over the past 2 weeks we have tested her several times (thanks to having Levelen Guru Livingston staying with us) and we’ve seen how as she has heat acclimatized, her numbers have changed; her run sweat rate has increased to its highest of the year (around 80+ oz per hour!!!) while electrolyte loss has remained constant. And her bike sweat rate has decreased as well as her electrolyte loss. With all this data I was able to fine tune her fueling plan. However, since she has been practicing it every week for the past 3 months, I tweaked it without making significant changes. But in summary, before the swim and during the bike, she’ll fuel as she has been practicing with a slight increase in sodium. On the run, she will have more flexibility to drink “a bit” more water in the 1st half of the run based on how her body feels. Since she loses more sweat/electrolyte when running, she will “load” a bit on the bike and manage her losses during the run. I hope that this tweaks will allow her to run to her full potential and judging by her recent training sessions, she is ready and in her best Ironman form. Now is just a matter of executing! Below you can see her fueling plan (offered to our athletes) to give you an idea and maybe help you develop your own. But, if you have a chance, get your sweat & electrolyte loss tested! It will help you develop a better plan and know what your body needs for your nest big race. Anyway, 3 more sleeps until the big day. All the tools we’ve used have helped to better prepare Coach Jana for the race and achieve great form. Now is her turn to execute and show what she her game! So, good luck to her, all of you racing on Saturday and those doing late season Ironman! If you are curious about our programs or have questions, please feel free to contact us. Train Smart!